The Hublet and I watched a fairly interesting film last weekend that has stuck in my mind and kept me thinking. 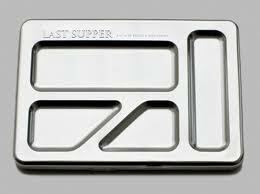 It was entitled ‘Last Supper’ and is the brainchild of Bigert & Bergström (Mats Bigert & Lars Bergström), an artist duo who live and work in Stockholm, Sweden. The film explores what ‘Last Supper’ means, both throughout history and various cultures, as well as in relation to prisoners facing execution. We speak to people wh o had the experience of choosing what they thought would be their final meal, until a last minute appeal brought them more time; we see recordings of those who planned their final meal prior to execution; the film devotes a lot of time to Brian Price, the man who took on the weighty responsibility of being a ‘death row chef’ and prepared over 200 last meals during his time as an inmate at a prison in Texas and who reconstructs one such meal for us. If I’m honest, although the content of the film was thought-provoking, sometimes fascinating and, in places, quite touching, I felt that the interviews were interspaced with a few too many cuts to facts and information about prison life, deaths and last suppers, and while these cuts were in places noteworthy and often cleverly presented, at times it bordered on the pretentious and occasionally lingered on screen for so long that it either felt like a self-indulgent piece of art-for-arts sake or as if it was deliberately being dragged out in order to increase film running time. Bigert & Bergström also deviate from the last supper focus to explore a number of related aspects, admittedly at times a little biased instead of being impartial and leaving the viewer to make their own mind up: is the practice of capital punishment a right one; is offering a last supper to a person about to be put to death by the legal system stupidly contradictory; is the last meal practice really a humane act of compassion or simply a way to absolve those involved of any feelings of guilt? This is clearly a topic that touches people, and a noteworthy point raised by Bigert & Bergström’s ‘Last Supper’ is that when a news article reports on a death row prisoner being executed, they sometimes give more detail about that individuals final meal choice than they do the means of their execution or the reasons behind their sentence, which shows where the reader fascination truly lies. 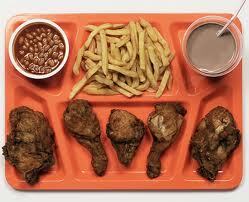 The subject is a compelling one: if you were to know the date and time of your death, what would your last meal be? There have been a number of books and cookery shows devoted to this subject, and one of the biggest has recently been Melanie Dunea’s book ‘My Last Supper’ where 50 famous chefs complete her questionnaire and share their final meals choices, and it’s the expected odd bag of results from a cross section of people renowned for their culinary creations, ranging from banquets involving truffles, blow fish, caviar, foie gras or lashings of duck fat while Mozart plays in the background, to the comparatively humbler choices of a British roast dinner; a hot dog; a bowl of good, comforting ratatouille. I find it fascinating that when faced with the fanciful notion of choosing anything we want to eat as a last meal, however ultimately on the proviso that we will never, ever be able to have it again, some go to elaborate lengths to titillate every sense, while others see the deeper meaning behind a final meal and choose comfort. This seems to be reflected in the meal choices of actual prisoners facing execution who make their final meal selection. If you look through the pages of the Dead Man Eating Weblog, listing a total of 313 final suppers but no longer updated due to complaints , you will see that the common denominator in most meals chosen by death row inmates is comfort food: fried or baked, pizzas topped with everything, hot dogs, enchiladas or chips, layered with cheese, chased down by pints of icecream, followed by fizzy sodas, sweets, cake and so on. It’s almost reassuringly predictable that the majority of the last requests ignore healthy living, calorie counting and denial, opting instead for the temporary consolation provided by a familiar taste or beloved food stuff. When you’re about to die you want to hang on to some good memories, to find some consolation somewhere. Interestingly enough, in September 2011 Texas made the decision to end its policy, dating back to 1924, of accommodating last meal requests to death row inmates after Lawrence Brewer, who had been convicted of murder, chose a last supper of two chicken-fried steaks with gravy and sliced onions; a triple-patty bacon cheeseburger; a cheese omelette with ground beef, tomatoes, onions, bell peppers and jalapeños; a bowl of fried okra with ketchup; one pound of barbecued meat with half a loaf of white bread; three fajitas; a meat-lover’s pizza; one pint of Blue Bell Ice Cream; a slab of peanut-butter fudge with crushed peanuts; and three root beers. Of which he refused to eat even one bite. This is not about arguing the pros and cons of capital punishment, this is simply a comment on the act of the final meal accorded to death row prisoners, of society’s fascination with the option of choosing a final meal for ourselves and the way we turn to comfort when in a corner. It’s a subject that either makes us reflect on the possible motivators behind a legal system that delivers capital punishment offering something that could be perceived as a compassionate option, and also what we ourselves would choose as our final meal, the taste we would wish to linger on our tongue as we closed our eyes for the last time.